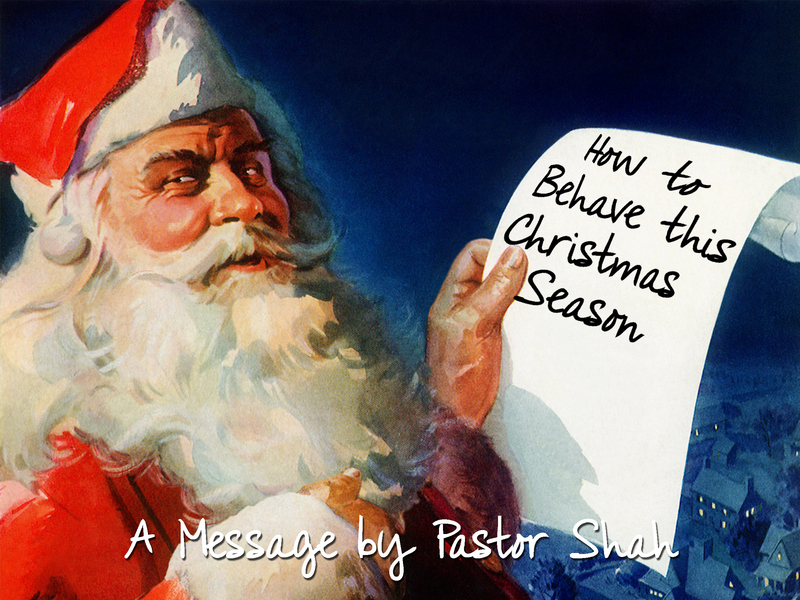 We are in a mini series from the Book of Romans titled – HOW TO BEHAVE THIS CHRISTMAS SEASON. Christmas can be a time of great joy, excitement, and laughter but it can also be a time of sadness, frustration, and contention. We need help in making this a season of joy. Last Sunday morning we looked at “How to Have Love Without Hypocrisy.” This Sunday morning we go to the next line. Romans 12:9-13 9 Let love be without hypocrisy. Abhor what is evil. Cling to what is good. 10 Be kindly affectionate to one another with brotherly love, in honor giving preference to one another; 11 not lagging in diligence, fervent in spirit, serving the Lord; 12 rejoicing in hope, patient in tribulation, continuing steadfastly in prayer; 13 distributing to the needs of the saints, given to hospitality. Overall Background: Before we can jump in and start explaining and applying this passage, we need to remember the principle that I shared last week—Doctrine and Application are interconnected. What you believe and how you behave are linked together. The mistake many Christians make is that they think – here’s my doctrine and here’s my application. First, I’ll get my doctrine straight and then set it aside. Next, I’ll work on my application and try to be a better person. They try it and it doesn’t work – very quickly they see that their love is full of hypocrisy— fake, conditional, selfish, superficial, selective, temporary and temperamental. What’s the problem? You cannot apply Romans 12-16 without looking back to Romans 1-11. They are interconnected. Romans 1-11 hold the key to apply Romans 12-16. This morning our text is “Abhor what is evil. Cling to what is good.” Let me caution you – don’t be took quick to jump in and start applying this passage. On the surface, those words seem very simple; they seem very straightforward. Just hate the bad things and hold on good things. But, try applying that and I promise you that you will fail miserably. You will end up hating what is good and holding on to what is evil. You will end up hating people rather than evil. In fact, you will do the very things that the passage says not to do. What’s the answer? We need to look back to Romans 1-11 and see what it says about evil and good. Application: We need to hear this message more than ever. We are living in evil days. Not just the world but also the church is confused about what’s evil. We have lost our sense of discernment. There’s something more – God has not called us to just be spectators but later in Romans 12:21 Paul says, “Do not be overcome by evil, but overcome evil with good.” That’s another message but before we can overcome evil with good, we need to understand what’s evil and what’s good. Before we can hate/abhor evil, what is the face of evil? Jeroboam – the first King of the Northern Kingdom. He was so determined to hang on to his throne, that he talked the eople into not going to Jerusalem to worship. Instead, he set up 2 golden calves in Bethel and Dan and said, “Here are your gods, O Israel, which brought you up from the Land of Egypt!” I Kings 12:30 said “this thing became a sin.” He rejected what Moses had instituted and created his own sacrificial system. He even became a priest of his own religion. He not only sinned but caused others to sin. In fact, later evil kings were always compared to him. A man of God came to confront him and Jeroboam stretched out his hand to order his arrest and his hand withered.Jeroboam begged, not for forgiveness but for his arm. The man of God prayed for his healing and he did and his hand was healed. Then Jeroboam invited him to come and stay with him and promised to give him a reward. Listen to his answer in I Kings 13:8-9 “But the man of God said to the king, “If you were to give me half your house, I would not go in with you; nor would I eat bread nor drink water in this place.” Why? Because God told me not to. 2. Jezebel – She was the daughter of a Phoenician King. When she married King Ahab of Israel, she brought the worship of Baal to Israel’s court. In fact her name itself says it – Jez-e-baal (Baal is the prince). She tried to destroy all God’s prophets. She even tried to get Elijah killed and he had to run for his life. She stole from the innocent (Her husband wanted the vineyard of Naboth – decent man trying to live on his little piece of family land. Jezebel falsely accused Naboth and had him stoned to death. Later she was violently killed as per God’s judgment. 3. 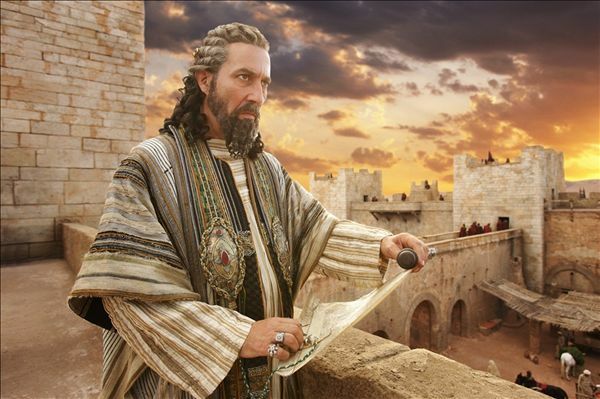 Herod – He was an Idumean, who ruled over Judea with the help of the Romans. He was a ruthless man. He would spare no efforts to extract taxes from the people. He did everything he could to please Rome. He had no qualms about killing people: He was afraid of the Hasmoneans so he had them all killed; he was afraid of one of his brother-in-laws—Aristobulus , the High Priest; he was afraid of his military leaders so he had 300 of them killed; he was afraid that his two eldest sons were after his throne. So, he had them both killed; and the list goes on. He even tried to have baby Jesus killed. When the wise men did not return to tell him where Jesus was, he had hundreds of little innocent baby boys killed. Do you have any Jeroboam, Jezebel, Herod, or Judas whom you admire? 1st Evil is those who reject God and actively try to obstruct the truth. We are to reject it. The second important mention of evil in Romans is actually in a Christian’s life. Listen to Romans 7:19-21 19 For the good that I will to do, I do not do; but the evil I will not to do, that I practice. Who is Paul referring to? He is referring to the believer who is frustrated with his/her Christian life – “Why do I do things that I don’t want to do? And why do I not do the things that I want to? Is this your experience? Are you going through the same struggle as Paul? Are you frustrated with your sin life? Then, your answer is about to come. 20 Now if I do what I will not to do, it is no longer I who do it, but sin that dwells in me. 21 I find then a law, that evil (the word is kakon = lack of any good) is present with me, the one who wills to do good. What is this evil? It is sin. It is the “old man.” It does not have any good in it. It is my Old Self. When you and I are saved, we received a new nature. The Old Man is crucified with Christ. This does not mean that it is eradicated. It is still there as long as we live in this world. As long as you live in this world, there will be a struggle. Evil is not out there. It is in here. There’s nothing about my Old Me that is good. It is selfish, self-centered, self-absorbed. “Amazing grace how sweet the sound that saved a wretch like me.” The sooner you can see your Old Self as a “wretch” the better. But don’t stop there – Abhor what is evil. Cling to what is good. How do you cling to what is good? By the Holy Spirit in you. Do you recognize the evil that is in the hearts and minds of people around you? Do you recognize the evil that is present with you? How do you deal with evil? Are you pre-occupied with it? Do you justify it, rationalize it, or blame it on others? Are you clinging to that which is good? To Christ who is in you. To the Holy Spirit who is leading you. To the Word of God that is given to you.